A 45-year-old AIDS patient presented with shortness of breath and productive cough of a few months' duration. He denied any history of malignancy or recent travel. On physical examination, he was found to be afebrile. A standard chest radiograph showed opacity in the basilar segments of the left lower lobe. There was no evidence of lymphadenopathy or pleural effusion. Then the patient underwent a CT-guided percutaneous transthoracic left lower lobe biopsy. The biopsy was negative for malignant cells but revealed abundant round and oval objects, which stained strongly positive for mucicarmine (Image). 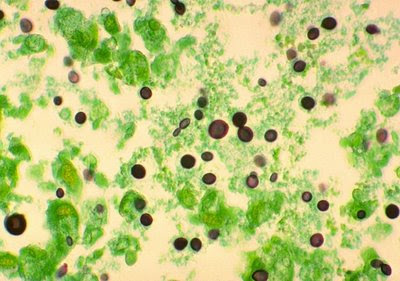 Identify the organism and enter your answer in comments section.